I love cooking, but lately I am over it. I hope this changes before next Thursday. In the meantime, here is my Monday night go-to meal. Four defrosted chicken breasts + 1/2 a jar of salsa + 1 tsp cumin + 1 tsp lemon juice placed in crockpot 4 hours on high or 8 hours on low. Shred. 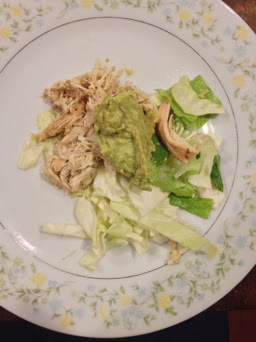 Eat with guacamole and whatever else you like for taco salad. If you want to make it 2 minute chicken omit cumin and lemon juice.